The MAKS 2015 International Aviation and Space Salon took place between Aug. 25 and 30 in Zhukovsky, near Moscow. RBTH presents the 8 most important features of this year’s event. MAKS 2015 was attended by 156 foreign participants from 30 countries around the world. The U.S. was represented by 24 companies, France by 6, while the presence of Chinese companies, with respect to the previous event, tripled. However, the numbers are significantly lower than in 2013 (MAKS is held once every two years), when 287 foreign companies from 44 different countries participated. The event welcomed many high-ranking guests from the Middle East. Iran has already voiced its interest in buying Sukhoi Superjets, while Egypt will buy the Ka-52 attack helicopter. 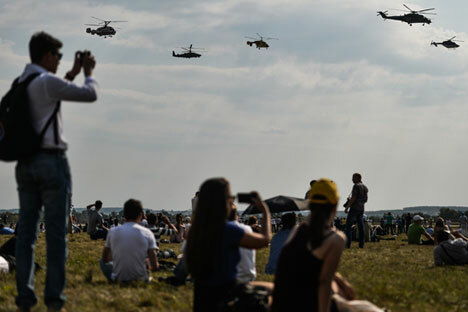 It was also announced that France is negotiating with Egypt the sale of one of the Mistrals, which, according to Russia's military, was supposed to serve as a base for the Ka-52s before its delivery to Russia was curtailed over Moscow’s role in the Ukraine conflict. Despite the crisis and the sanctions, which have affected the Russian military industry, cooperation with European countries in the sphere is continuing. Airbus showed off its A-350 wide-body passenger plane and the multipurpose H225M helicopter. Russia’s Tekhnodinamika Holding, which produces aviation components, and the French company Microturbo (a part of Safran) signed an agreement on the joint production of an auxiliary power unit for civilian use. Belarus announced that it was buying five Tor-M2E short-distance antiaircraft systems and signed a contract for the supply of another unit of the four newest Russian Yak-130 combat training planes (the Belarus Air Force currently has 4 Yak-130s). Representatives of the United Engine Corporation announced that now the AI-222-25 engine, which is installed in the Yak-130, will be fully made in Russia. The engine was previously produced with the help of Ukrainian components. It was also announced that the Mi-38 helicopter is now to use Russian engines (they were formerly Canadian). The Rostec stand contained a full-sized model of the multipurpose Chirok unmanned aerial vehicle, the Zala Aero Company (from the Kalashnikov Concern) demonstrated the new air reconnaissance operational-tactical system, while the KRET Company exhibited the concept-project of the attack drone. The Ural Civilian Aviation Plant, famous for providing the power capacity for the assemblage of the drones bought in Israel, is now planning to build UAVs based on the Austrian light Diamond DA42 airplane. The expected signing of the contract with China on the supplies of Su-35 fighter jets did not take place during MAKS. However, it was announced that by the end of 2015 the Russian Defense Ministry will sign a new contract on the supply of an additional number of Su-25s to the Chinese Air Force. Currently, the delivery of the first unit out of the 48 planes is being concluded. The Sukhoi Civilian Aircraft company signed a contract for the supply of 32 short-haul Sukhoi Superjet 100 planes with the State Transportation Leasing Company, which has an option to buy another 28 planes. The client should receive the planes between 2015 and 2017. The first planes will be delivered by the Russian Yamal Airline.